Cook’s Old Mill welcomes visitors at Greenville, West Virginia. Photos courtesy Lisa Stansell Galitz. It’s rare that I have the opportunity to show my daughters a back-road attraction in West Virginia that they haven’t seen before. They’ve joined me on hundreds of adventures to remarkable places both on and off the beaten track. Each carries a W.Va. gazetteer in her car and is usually up for a day-trip, no matter the weather. (Yes, the nuts don’t fall far from the tree.) So, it was a surprise and delight to be able to introduce two of them to Cook’s Old Mill, which they had each driven past many times but had never stopped to see. 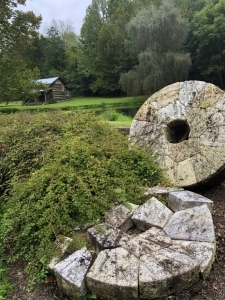 Millstones tumble along the mill pond. Several weeks ago, we—myself, the eldest, and the middlest—found ourselves on Route 122 west of Greenville in Monroe County, about 20-minutes south of Union. A bald eagle had stopped us smack in the middle of the road. (“Was that a bald eagle?” we asked, trying to contain our excitement, desperately trying to get a good photo. We spoke about that eagle for days and never did get a clear shot of it.) However, we were coming up on Greenville, a small town that, like many small towns in Appalachia, used to be more than it is. 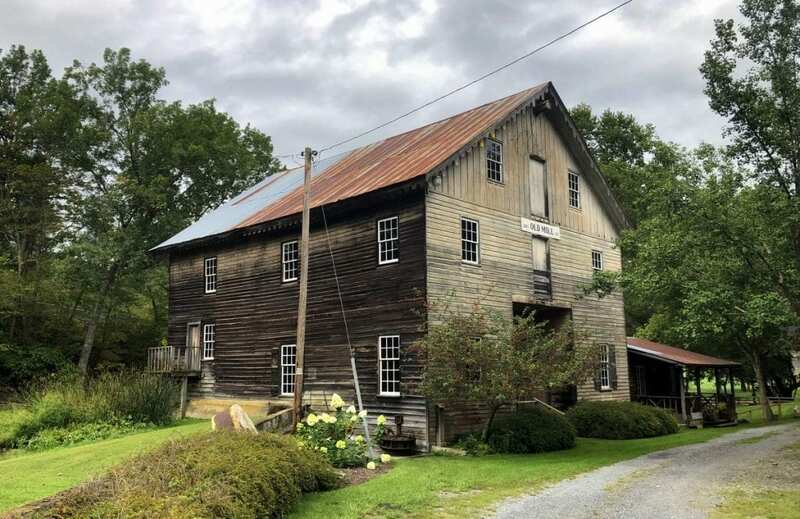 I knew Cook’s Old Mill was just on the side of the road and wanted to make a bitty stop at this very cool place — especially once I found that neither had been there. 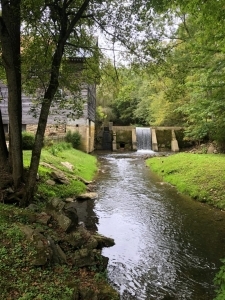 Privately owned, Cook’s Old Mill has been restored and expanded through the years. 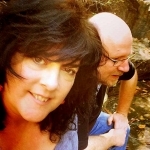 Its current owners, Fred and Barbara Ziegler, bought it in 2002 and now welcome visitors to walk the grounds, take photos, and picnic by its mill-dam’s waterfall. Fun fact: The current concrete dam was built in 1906 and incorporates hundreds of horseshoes used as reinforcing material. The Ziegler’s live across the street in the lovingly restored Miller’s House. They will, if home, answer the door and provide more information and a tour, if convenient. Mill-stream springs from within caverns. This is one of my favorite places to bring visitors on a day-trip through Monroe and Summers counties.A snack at one of the picnic tables or on a blanket near the creek, soft dappled sunlight shining through the trees, the song of water flowing over the dam — these are enough to recharge my brain and soothe my soul. We meander around, peering through the windows and admiring a small double-roller mill displayed outside its main doors. We make our way across the wooden bridge and the overflow. It’s here we can see where the waterwheel used to turn, slowly grinding corn and wheat for families who settled along Indian Creek. It is also the perfect place to pull up a stone to sit on and view the water flowing. The girls walk around the mill pond, fed by a spring the flows out of a system of caverns about a quarter-mile upstream. On one of these trips I’m going to hike up and see the spring. For now, I’m content to sit and listen to the water in my own reverie. As remnants of Hurricane Florence threatened our tranquil detour, I snapped some photos, and we made our way back to the car. Formerly known as Centreville, Greenville is notably located along the Mountain Music Trail and hosts musical events throughout the year. The entire area is steeped in history from the late 1770s onward and includes plantations, prehistoric sites, and the remnants of a Civil War encampment.